Consider an inverted pendulum ( balancing a broom stick upright in the palm of your hand). When there's a variable wind blowing from the South. The inflation rate is how far North the top of the broomstick is. The nominal interest rate is how far North your hand is. The natural rate of interest is the force of the South wind blowing the top of the broomstick North. You need to make the broomstick lean South to offset that force, else it will fall over. If you want to increase inflation (move the top of the broomstick North) you must initially move your hand South, and then move your hand North. If you hold your hand still, the broomstick will fall over. You need to do something other than discussing eggs, cliffs, broomsticks, and such, to communicate with me. You might as well be saying: The purple dog ate some caviar, then flew to San Diego. When speaking to an economist, speak economics. But maybe you're speaking to someone else. Maybe your intent is to say to other people: "Look, this guy is talking total nonsense." If that's the case, the answer is the same. First write it down in formal economics. Do you think you could give that a try, or are you going to continue taking the "this guy is spouting nonsense" route? I should add that you're a tenured professor in a university in which, if my understanding is correct, research is important. In my experience, it's normal to think that tenured professors teaching in research universities should be able to put a sound economic argument together. It would be unacceptable for one of our PhD students to answer an exam question by arguing, in the way you have, by analogy. So, it's unacceptable for you too. What a great analogy. Thank you, Nick. Would it be acceptable for a PhD student to answer an exam question by pretending he's speaking to a made up person from the moon? Steve: OK. Let me try (though I may fail). Every year, firms increase prices by what they believe is the Bank's inflation target. If the Bank wants to validate their beliefs, it sets the nominal interest rate equal to what it believes is the natural rate, plus target inflation. The Bank sometimes makes mistakes, because it does not have perfect information on the natural rate, except ex post. Firms know the Bank has imperfect information. Firms know the Bank has an incentive to create a boom, by setting the nominal rate too low, given firms' expectations of inflation. (Standard New Keynesian Euler equation IS curve). Because with monopolistic competition the level of output is suboptimal. Firms cannot distinguish between the Bank having made a mistake about the natural rate, and the Bank having changed its inflation target. (The Bank has imperfect credibility). In order to signal to firms it has lowered the target rate of inflation, the Bank must create a costly recession. This requires raising the nominal interest rate, until firms adjust downwards their beliefs about the Bank's target. I could cook up another model, with inflation inertia (Just like the Calvo model, except where the fairy visits each firm non-randomly), that would give similar results, but I find the signalling model more plausible. Empirically, the Bank of Canada tells us it raises the nominal interest rate when it fears inflation would be too high if it did nothing, and lowers the nominal rate when it fears inflation would be too low if it did nothing. 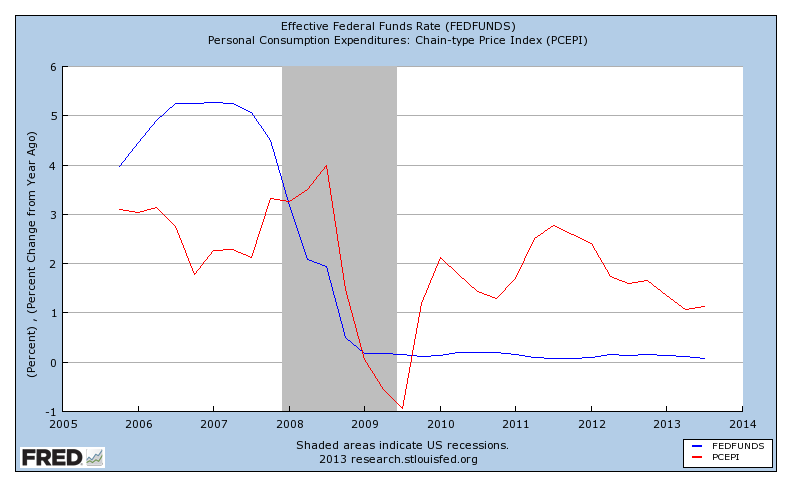 (That is the exact opposite direction from what you are saying is the true way to raise or lower inflation). And the Bank of Canada has hit its 2% target almost exactly on average. Either the Bank is lying, or this was a total fluke, if you are right about raising nominal interest rates causing higher inflation. Anonymous 2: I found Steve's Moon Person metaphor very useful. It makes a good point about the empirics. My own metaphor was intended to make a point about directions of correlations vs directions of causation. Steve: my model-building days are mostly in the past, I'm afraid. And even though I look back on some of my models with some fondness, I have to admit that hardly anybody ever read them. I'm not sure how much use they were to anybody, except getting me tenured. Nowadays I'm just a burned out ex-administrator and blogger. But I really do want to change your mind on this, because you and your students are the future. So I'm going to do my best to change your mind, or at least get you to see the problem. A slightly more realistic model would have a small fraction of the firms having perfectly flexible prices. Then if the Bank set the nominal interest rate too low, some prices would rise immediately in the boom, and all firms would observe that the Bank had set the nominal rate too low. But the math would be a bit harder. 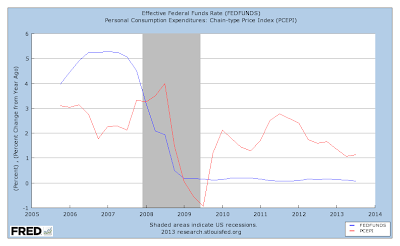 "...if you are right about raising nominal interest rates causing higher inflation." I didn't say that. There's always something monetary going on in the background, right? I'm making the argument in terms of nominal interest rates because that's the way everyone seems to want to think about monetary policy these days. The model you described to me is a pretty straightforward New Keynesian model, and we're all familiar I think with how that works. So, your first comment seems to be that there is some kind of stability problem somewhere. But in this post I didn't talk about any models - it's purely informal reasoning based on looking at some data. So what exactly is wrong there? How can you argue with the proposition that, if the inflation rate is to go up that, in the long run, the nominal interest rate has to go up? "So I'm going to do my best to change your mind..."
You seem pretty convinced of some truth that you want to get across to me. But I can't figure out what it is, or how you arrived at it. So far you're not doing a great job of convincing me that I should pay any attention. Why should I sit up and take notice when a burned out ex-administrator and blogger tells me there is something wrong with my reasoning? Fair enough, Nick. It just amused me that in a post I chose not read to the end because the rhetorical style got in the way of the content, the author had a go at you for exactly the same digression. "Would it be acceptable for a PhD student to answer an exam question by pretending he's speaking to a made up person from the moon?" You don't seem to understand the context. Nick has been arguing this for the past week or so. He seems to have something formal in mind, but I'm yet to see it. If my student were writing a blog, he or she would get points for being funny. So Moon People would be great. No, I get the context. But I still don't see why your dialogue with moon people help you make your point better than the style of your previous posts. In the same way as I don't see why Nick needs to come up with unitelligeble metaphors. There's no "making the point better." I'm giving you some other information. I hope you understand that the moon person is a rhetorical device. You're supposed to put yourself in his/her shoes, and forget all the other stuff you think you know. It doesn't bother me if you don't like it. Apparently Nick did. A metaphor, as Nick used, is also just a rhetorical device. I just found it amusing that you chose to criticise him for it in your comments to this particular post. On what planet (or moons thereof) is a false analogy and a rhetorical device of inventing a fictitious person, somehow the same thing? the basic problem with your comment is that you are talking about a broomstick whereas the subject is money, interest rates and inflation. Broomsticks are not money, interest rates, or inflation. They are altogether different things. As such, if you want to tell someone how to balance a broomstick on their hand, your comment could be useful. However, if you want to discuss money, interest rates and inflation, your comment is of no use whatsoever. 1. My broomstick metaphor shows that a positive correlation is consistent with a negative causal relationship. 2. I could equally argue I have never found computer models useful either. 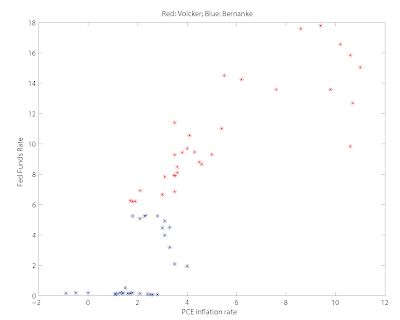 What have electrons wizzing around in a computer got to do with interest rates and inflation? 3. In the olden days, before computers, Bill Phillips made a macro model out of plumbing. So did Irving Fisher. Broomsticks seem quite plausible in comparison. That's interesting. Phillips actually built a physical model of the economy, to capture in the physical model what is going on in the IS-LM model. So, in that case the physical model is actually more or less the same model as the mathematical representation. Not quite, though, as there are dynamics in Phillips's physical model that are not in the mathematical model. It's different though, to have a model represented by some equations, and to assert: Oh, that's just like a roller coaster, or that's just like how a steam turbine works, or that's like an egg rolling over the cliff and colliding with a broomstick. Those statements may or may not be true, and if they're not, then making those statements is just confusing. I think a mathematical model, with inflation inertia, where the rate of change of inflation is a positive function of the output gap, which in turn is a negative function of the real interest rate gap, would work just like my broomstick model. You just need to repurpose this report by changing what the variables represent. I can't believe it! I found the exact lab from the same class I took at my alma mater back in the 80s! That's what set off alarm bells. 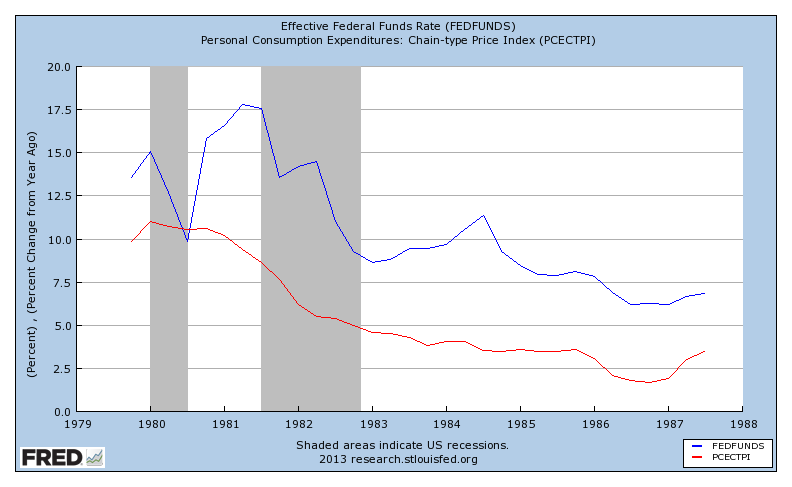 ""...if you are right about raising nominal interest rates causing higher inflation." I didn't say that. There's always something monetary going on in the background, right? I'm making the argument in terms of nominal interest rates because that's the way everyone seems to want to think about monetary policy these days." 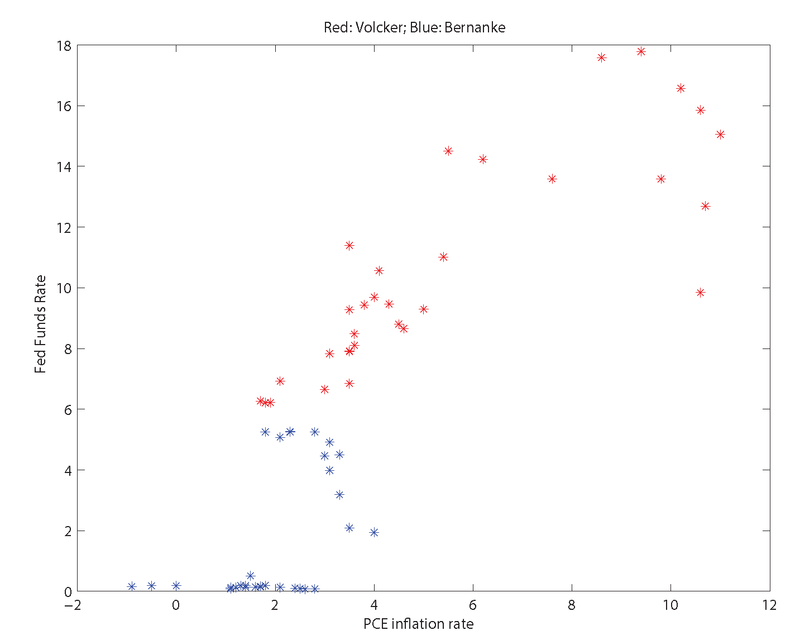 But if we do have to follow the crowd and talk about monetary policy in terms of central banks setting nominal interest rates, we really do need to recognise the difference between: raising nominal interest rates in order to prevent inflation rising above an existing target; and raising nominal interest rates in the context of an increase in the inflation target. "I think it's a very dangerous and misleading way to think about monetary policy." Actually, I think it's OK. Typically you can specify the policy either in terms of nominal interest rates, or in terms of quantities on the central bank's balance sheet. One is just the flip side of the other. Of course when you get into more complicated things like QE, there are more dimensions to how you specify a monetary policy rule. One thing I do think is dangerous is that some people now seem to think that a central bank actually just chooses a nominal interest rate. That's what happens in a Woodford model, as he left all the quantities out. So maybe we agree on that. "we really do need to recognise the difference between: raising nominal interest rates in order to prevent inflation rising above an existing target; and raising nominal interest rates in the context of an increase in the inflation target." Agreed. But don't you think it's interesting if the rule that is supposed to deliver the inflation target implies that you get stuck at the zero lower bound and never hit the target? Steve: "One thing I do think is dangerous is that some people now seem to think that a central bank actually just chooses a nominal interest rate. That's what happens in a Woodford model, as he left all the quantities out. So maybe we agree on that." We very definitely agree on that. "Typically you can specify the policy either in terms of nominal interest rates, or in terms of quantities on the central bank's balance sheet. One is just the flip side of the other." Hmm. I think your "Typically" is carrying a lot of weight in that sentence. It depends on what you are holding constant. I would say that current nominal interest rates are inversely related to the current size of the balance sheet relative to the expected future size. "But don't you think it's interesting if the rule that is supposed to deliver the inflation target implies that you get stuck at the zero lower bound and never hit the target?" Yes! I think it's more than interesting. I think it shows the total failure of thinking about monetary policy as central banks setting a nominal interest rate. The nominal interest rate tool fails, right when you need it most. Excuse me while I become unintelligible again, but I think it shows that thinking of monetary policy as setting a nominal interest rate is a very bad social construction of reality. I blame the New Keynesians/Neo-Wicksellians/Woodfordians. If we thought of central banks setting a nominal quantity, or nominal price, and if central banks communicated their policy this way, getting stuck at the ZLB would never be a problem. Just raise the growth rate of M, or raise the growth rate of the price of gold, or iron, or apples, or whatever, and up goes the inflation rate and the nominal interest rate. Because I can't resist my unhelpful metaphor: You want to move the broomstick north, but you can't move your hand south, because there's a ZLB wall in the way. So you grab hold of the top of the broomstick, and move it north. What if the central bank has negative capital? "What if the central bank has negative capital?" Roughly, the Fed's liabilities are not liabilities in the usual sense - they are not promises to pay anything. So there are no particular economic consequences if the central bank has negative capital, as we would normally measure it for a private firm. 1. Are you thinking about the general issue of indeterminacy with a nominal interest rate peg, like what happens in some of the older literature, e.g. Sargent and Wallace's 1975 paper? 2. Central banks do indeed peg nominal interest rates over the short term - they set a target for an overnight nominal rate typically, and then try to hit that target over a period of several weeks until they re-optimize and choose another target. As you know, the Bank of Canada is really good at hitting its target. Why central banks do it that way I think is clear - it absorbs a lot of short-term shocks to payments systems and financial markets in general. So, that's what central banks do, and there are good reasons for it, We want to think about alternative ways of doing policy to make sure they are doing it right, but you seem convinced that they're doing it wrong. Steve: I used to worry about indeterminacy under an interest rate instrument. Then I saw the Bank of Canada use the interest rate to keep inflation close to target, and I swallowed my theoretical qualms. It seemed to work in practice, even though it was theoretically problematic. And then a number of central banks hit the ZLB. And my old theoretical qualms re-emerged as a very real practical problem. How does the central bank signal a loosening of monetary policy, when the only thing people are watching is the nominal interest rate? Yep, I get the point that it needs to accommodate shocks to money demand and the payments system. But there has to be a better way. Because it failed to accommodate the recent banking crisis's shock to the payment system. 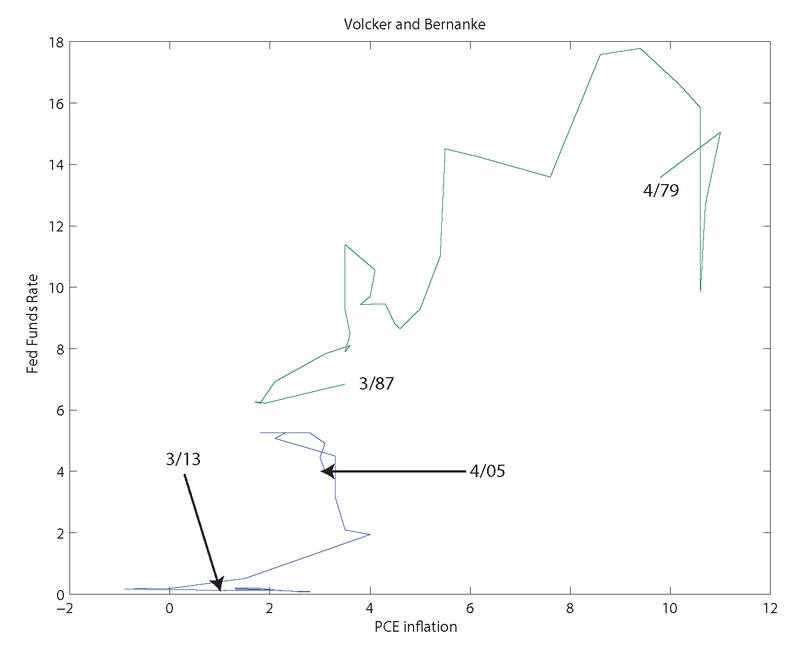 You know that they didn't give that guy the prize for his work on the science of monetary policy, I hope? I hate to digress, but talking about Fama, it is interesting that in an interview a few years back he claimed that asset prices were not the cause but rather the victim of the recession, which happened for reasons economists haven't figured out yet. Yes, I'm not willing to give Fama credit for much. Lars Hansen made important contributions. Fama not so much. Stephen, not everyone can be a theorist like you. You also need empiricists lie Fama, who push hard on popularising certain concepts (in this case, an early version of Rational Expectations, which is what the efficient market hypothesis basically reduces to in the end). Fama I think was one of the main influences on the creation of the passive mutual fund industry, which may have saved investors quite a lot of money. Also the Fama French 3 factor has been quite useful in the asset management industry and corporate finance. Please don't knock Fama, asset pricing and macroeconomics are almost like Siamese twins. The point I think is that a lot of New Keynesian thinking relies on the fed controlling interest rates, but in an environment where the payments system is so efficient that monetary frictions (as opposed to more general liquidity/credit frictions) are irrelevant without the inconvenience of nominal price rigidities. But it is easy in that perspective to think of models where the Fed doesn't necessarily have any clear control of the interest rates that matter, except perhaps by coordinating expectations in a certain way if you have indeterminacy. Woodford finds clever ways to get around this and argue about how the Fed can control nominal interest rates even in a world with perfect electronic money, but I'm still not completely sure how convincing his arguments are. But yes, Fama didn't get his prize for monetary economics, neither did Kydland and Prescott for their real business cycle work. "...neither did Kydland and Prescott for their real business cycle work." 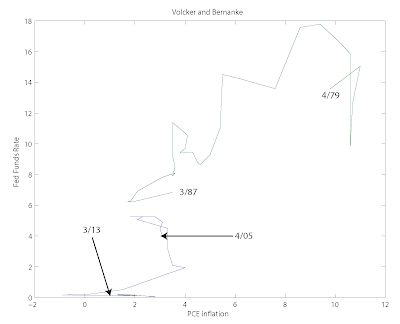 "The Sveriges Riksbank Prize in Economic Sciences in Memory of Alfred Nobel 2004 was awarded jointly to Finn E. Kydland and Edward C. Prescott "for their contributions to dynamic macroeconomics: the time consistency of economic policy and the driving forces behind business cycles"
So they got it for time consistency and real business cycles. Notice that I'm commending Lars Hansen for his empirical work. I think he's a much better empiricist than Fama. People who think that markets are efficient have nothing to contribute to the explanations of recessions which are, if one ignores aggregation issues, one of the severest forms of market failure (besides climate change, a negative externality and the usual issue of lack of competition on markets). Even people who respect Fama (Scott Sumner, for instance, who also thinks the recession caused massive asset price drops more than the other way around) didn't think much of his take on macro/monetary economics. Anonymous, "efficient markets" in the EMH sense means something very different from the standard economic concept of "efficiency" meaning free from market failures. The EMH is about INFORMATIONAL efficiency, not social efficiency in the utilitarian sense. The EMH applies to large, liquid, fungible markets like stocks. New Keynesian sticky price theories contain inefficiencies in the normal sense, but are perfectly compatible with the EMH. TGGP is correct. Indeed, Fama's notion of "efficiency" is very narrow. This only has to do with the time series properties of asset prices. One important point: Market failure is not observable. You need a theory to extract information about inefficiency from the data. A recession could occur due to factors that policy can do something about, due to factors that policy cannot do anything about, or some combination of the two. The fact that you observe a recession is not prima facie grounds for intervention. I don't understand very well. On the one hand it is said that the prices are determined by supply and demand. Inflation is measured as a variation of the prices of goods and services. Then S. Williamson says that inflation is determined by "liquidity premium". So I think that he is saying that supply and demand of goods and services are determined by the liquidity premium on government debt. The question is how is this supposed to take place. "supply and demand of goods and services are determined by the liquidity premium on government debt." You're confusing levels with rates of change, in part. There is an important interaction between the supply and demand for goods and services and the supply and demand for assets. That's all part of a dynamic proces in which the inflation rate plays an important allocative role in its effects on the rates of return on assets. I found this thought provoking. Possibly late to the party, but Josh Hendrickson takes a stab here at what the fundamental point of disagreement is between you & your critics on QE/deflation is. Man, this is such tortured reasoning! Next item on your agenda should be: How moving the stock's price changes the companies forward earnings. It's only tortured if you're locked into thinking in a particular way. Nick Rowe and Som Dasgupta have it write. This is a crap post. Sorry for the language but that is the most frequently used word in it. Your subsequent discussion in comments defends the indefensible, a pattern it seems. Let's start with your last thread, and admit, despite your backhand at TGGP, above, EMH is not limited narrowly, information not traded solely on exchanges. Schiller, years ago suggested asset markets for future labor earnings, etc. More to point, for years, I've used weak, semi-strong and strong efficiency in classes to explain situations as diverse as fraud on consumers, insider trading, and monopolistic competition, and could use it for your discussion of N.K. 's actions previously. Control fraud earnings require strong-form inefficiency. Nothing recondite, just some people who were naked when the tide went out, as we used to say. In and in the present post, the banking industry lobbying shows pretty clearly. What does this mean? Well, banking runs on markup. On $1, 10 percent is a dime, on $2, 20 cents. Need one say more? Really, your purse strings are showing in this argument. 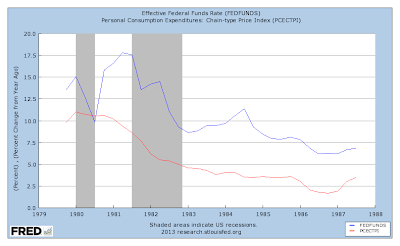 For my taste, why not induce inflation by raising wages, instead of interest rates? It would work; and not so much a misuse of power by your employers (or should one say stockholders). Be careful! Half of your post made me laugh, since breaking oil markets not Fed rates were responsible for ending inflation after 1980. The Fisher relation, or Gibson paradox, has a cleft history. I like L. Klein, Atlantic Economic Journal, 1995; but that is typical of most time series analyses. The correlation switches signs and feedback is Granger significant both ways. In your next post, you will engage in sputtering unemployment insurance bashing. A trifecta of right arguments. For cronyism as a base banana, a few scoops employers' profits at everyone's expense next, and a cherry on top, a good bash at the poor. Yes sir, "It's only tortured if you're locked into thinking in a particular way." "Nick Rowe and Som Dasgupta have it write." That's the funniest thing I have red in a long time. Glad your appreciation extends to even to sanguine humour. BTW, Nick's broomstick is a bit too stable. The bank actually uses hickory rods when holding the banking system. Canada may be an outlier, 'cause the temperature keeps it stiffer. In Canada they balance a hockey stick on a moving Zamboni. I'd like to point out that Nick's analogy of a broom's orientation relative to the "wind" vs true north was his intuitive representation of the two frames of reference: "nominal" versus "real." Ie, "moving" vs "absolute." I thoroughly understand Nick's model, but I'm so far slightly inclined to be open to Steve's model being more representative. However, like Nick, I have trouble understanding the "microfoundations" of Steve's model, and I think Steve is sometimes too flippant, such as comparing the economies of 1981 and 2006. It seems that unemployment and/or the prevaling wealth- and wealth-satiety environment matters quite a lot in determining where the real interest rate lies relative to the nominal rate (ie, how fast is the wind blowing). Still, there is a (seemingly)-"simplistic" level where Steve's model does make narrative and empirical sense - but I keep wondering how much that is just an illusion, since it becomes much less clear the more realistic (complex) a (mental) model you try to understand it within (because details matter a lot - the economy is a non-linear dynamic system where small initial changes lead to huge changes in outcomes). Ultimately, it seems this debate hinges on where you believe the prevailing "natural rate" of interest "wants" to be - Keynesians believe it's south of zero (and the nominal rate) due to weak demand, while Steve seems to believe it is north of 0 - and being artificially kept close to zero by the FED's actions. Nick believes a rising FED rate will push the real rate further south (more negative) by decreasing already diminished borrowing, while Steve seems to believe that as the FED raises the rate, the real rate will shadow the movement of the real rate, to a certain point. In a way, these are just corresponding views from the (money) Demand and Supply sides, but they can't both be right. I wish ya'll could get in the same room and come to terms more effectively.